It's time to start a new Cover to Cover series, a regular Gaming After 40 feature in which we examine an old game company's catalog, page by page, for nostalgia and history's sake. Aardvark Ltd. (a.k.a Aardvark-80 and Aardvark International, among others) was a small computer game publisher in the early 1980s; I did a video podcast about the company a while back, and while its games are not well-remembered today, its catalog provides some insight into the fragmented, free-wheeling nature of the computer game business at the time. Quest and Wizards Tower appear to be similar, written by Bob Reteille and Aardvark founder Rodger Olsen. 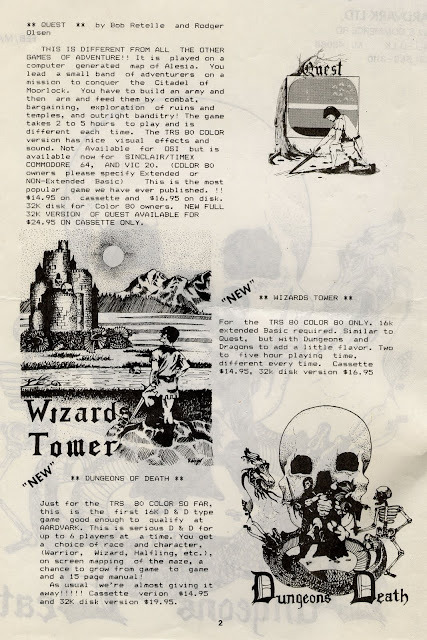 We aren't told much about Wizards Tower -- my guess is both games ran on the same engine, or in more realistic terms for the technology at the time, one was derived from the other's BASIC source code. Quest is an odd creature, apparently a map-based military simulation with RPG aspects, and it was available in different versions for the TRS-80's two flavors of the BASIC programming language. Stranger still, the 32K "FULL VERSION" was only available on cassette, while the regular disk version also required 32K; perhaps memory overhead devoted to managing the disk controller in BASIC prevented running the complete implementation on disk-based systems. 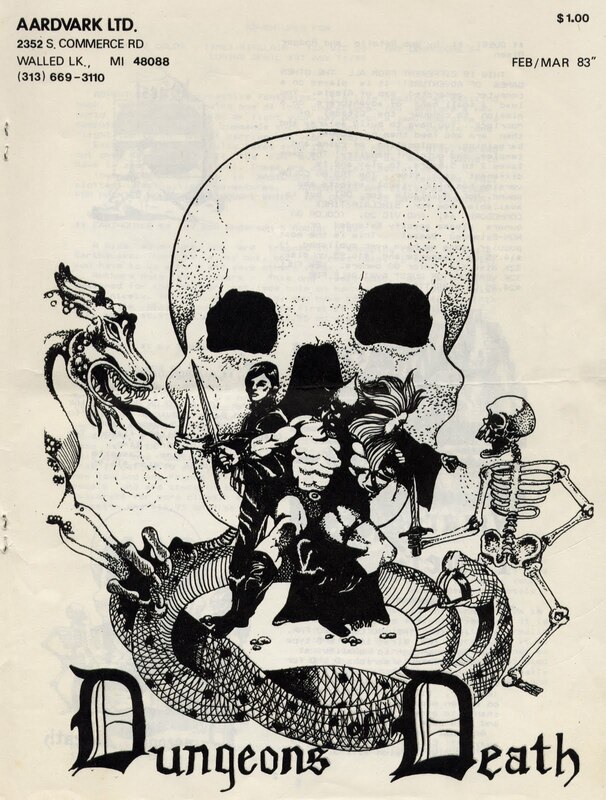 Dungeons of Death was one of many products trying to mimic TSR's D&D role-playing game system on a home computer, and while I'm sure it was a noble attempt, the thought of "up to 6 players at a time" crowded around a TRS-80 Color Computer keyboard is not an attractive prospect. But it did have a substantial manual (15 whole pages!) and an ongoing character development model, so while the dungeon maps were randomly generated and likely all pretty much the same, each player could develop an emotional stake in their characters as they leveled up over time. I don't know how successful Aardvark was -- I bought a few of their games for the TRS-80 Color Computer myself back in the day, which is probably why I have this catalog in my collection. The company's games were either not widely sold, or not heavily pirated, as they don't seem to turn up in the online archives very often. In fact, little seems to be known about most of the games featured on page 2 of this catalog; the most I could find with a little quick Internet research was a screenshot of Quest and a few gameplay details, at L. Curtis Boyle's excellent CoCo Games List website. For the moment, then, it seems these catalog pages may be all we have left of some of these titles. One of the reasons I started this blog is that, like it or not, time passes, and some of these things just disappear. I try to preserve what I can. I located a copy of Dungeons of Death for the VIC-20 and dumped it. You can get the file and read some comments about it here! Thanks for sharing, Greg! That's excellent -- the Aardvark library seems to have faded quickly from circulation in any form, even piracy seems to have missed most of the company's titles. This kind of preservation is so important -- thanks! I wasn't involved with Wizard's Tower, although knowing the way things worked at Aardvark, it's not unlikely that it's based on my code for "Quest". I see that they finally dropped the "II" from the name of the game.. Rodger originally said calling it "Quest II" would make people think it was a sequel and enhance it's appeal. Quest was one of the first of the graphically oriented computer RPGs that set the stage for so many of the genre. While the graphics were still pretty crude at the time (hard to make it out in the screenshot in the catalog), it was a departure from the text based games up until that time. The screen was divided by a river into two sections, the lower section had a town, the upper was where the Tower of the evil Wizard was located. You had to take your hardy band of adventurers out into the wilderness and fight monsters, amassing gold and items to eventually cross the river and ultimately do battle with the Wizard. As you fought your way across the land you could add to your number of followers as well as upgrading their equipment. There was swampland (slowed you down) and mountains (impassable) that changed with every playthrough, so it wasn't too awfully repetitive. There was also pretty heavy reliance on random events so it got away from the programmatic progression of the text-based games. You had to feed your army and deal with the amount of stufff they were carrying (many games I'd end up ditching quantities of gold that were no longer needed because of it's weight), and the town had an irascible storekeeper who would buy and sell items, and with whom you could bargain.. to a certain extent. All stuff of course that's standard today in this kind of game, but pretty pioneering at its time (if I do say so myself). Quest was one of the games (along with "Time Trek") I'd written that I enjoyed playing more than a few times. Unfortunately record keeping was pretty lax at Aardvark, so I really don't have any idea how many copies were sold, but I do know both Quest and Time Trek were their two top selling games for a long time. Somewhere around here I have the source code and one of my "one of these days" projects is to write an update using something like "Dark Basic" or "BlitzBasic" for the PC, just for nostalgia's sake. I really, really enjoyed Quest. Thank you. I played the heck out of Pyramid and Dungeons of Magdarr, and wanted to get other Aardvark games at the time (Mars, Earthquake, I forget...). They weren't Ultima, but they were charming to me at 13 years old on my Commodore 64, and I very much enjoyed them.